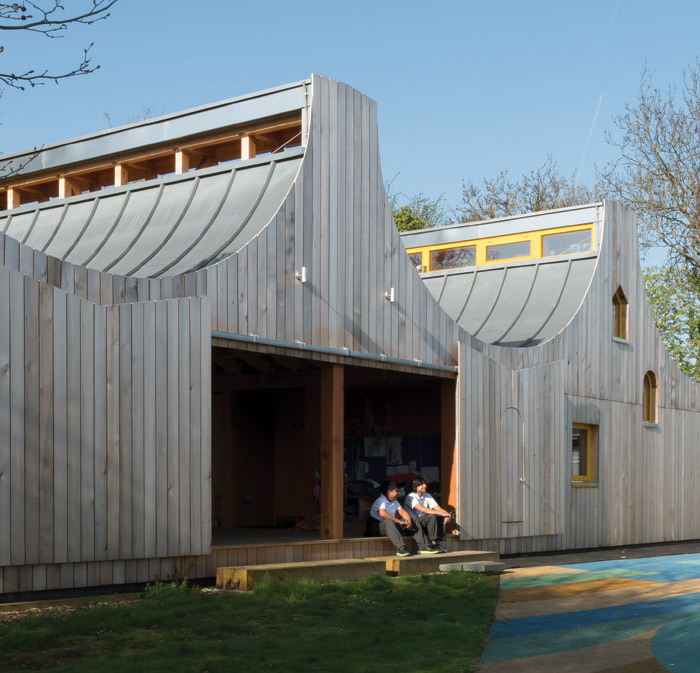 Sitting on the edge of a small woodland area, Belvue School was adjacent to an untapped educational resource, a precious thing to come by at an SEN school in London. The scrub of land was not ambitious in its scale and planting, but the area could provide London students with a glimpse of nature, scarce in the area. Independently, the school enough money to install two shipping containers, providing storage and support spaces to make use of the underutilised woodland. Shipping containers are not building materials. They were never made to facilitate learning and provide enrichment, and would not have fully resolved the problem. Studio Weave was approached by Belvue School to achieve more flexibility, as well as larger and more useful spaces on a similar budget. It has achieved this and more; rooting the school in its woodland context and providing better spaces to learn, play and explore. For Studio Weave, the art of building contextual spaces in rural locations is nothing new. From a hiking shelter on the outskirts of Bordeaux to a residential care home in a Kentish village, its experience is rooted in producing architecture that works with the surroundings, without blending into it. It creates powerful, but most importantly useful designs. In the design process, Studio Weave made the students its client. It held story-writing workshops in the school to construct a narrative for the woodland and the woodland classrooms. Through this, it was understood that three core spaces were required. The ‘Cosy Lounge’ is the principal teaching space. 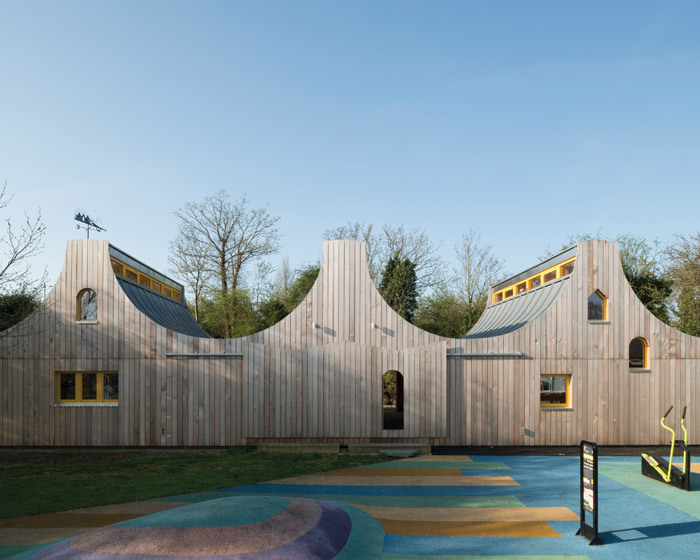 It offers a connection to the wildlife as well as an essential private sensory space in which students can relax and be calm. The ‘Sociable Kitchen’ provides a cafe, kitchen and dining area. The ‘Messy Barn’ is for outdoor learning in all weathers. Each space is to inform essential life skills for students, nurturing their autonomy and sense of responsibility. 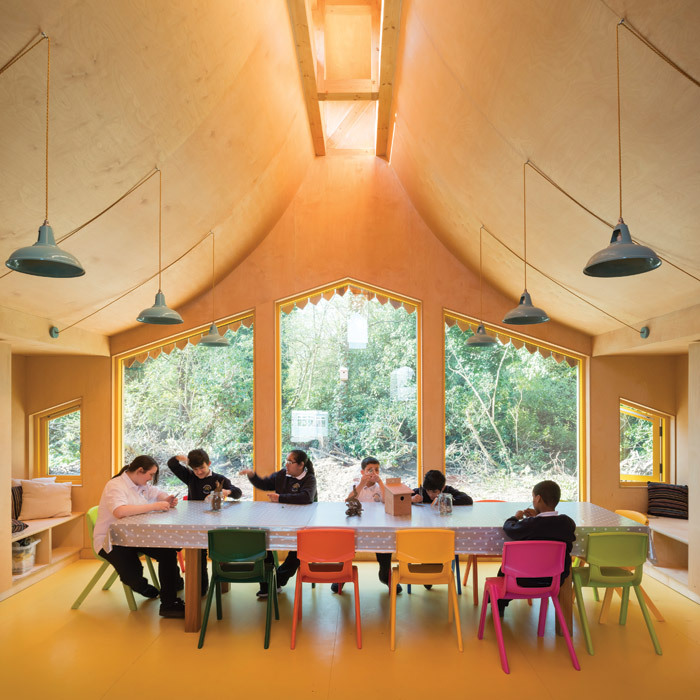 The woodland classrooms consist of a central, open space, covered by the same curved roof that connects the ‘Cosy Lounge’ and ‘Sociable Kitchen’. Sliding doors enable this space to be open, to let the nature in, or closed off, creating a more private space. Within this sliding door are wicket gates, to provide secondary access. This divergent world, created for the students, is kept distinct from the typical classrooms and play area. The woodland classrooms create a gateway to the area, which to London students will at first be a daunting, yet magical place. The action of opening the sliding doors is theatrical. Students must wait and as teachers draw open the large doors and the woodland stretches out in front of them, the anticipation builds. It provides a space to pause as they leave the familiar behind in favour of new discoveries. Although larger than the original shipping containers, the spaces remain intimate. In their material palette and form they take on a domestic quality; a reminder of home and safety in the unchartered territory afforded by the now reachable woodland. The concave roof, while creating a domestic feel, also provides a surface to reflect light pouring in from the roof lights and dissipate sound. Across the timber-clad façade, small windows are placed sporadically on the side facing the school. The playful arrangement with yellow windowpanes creates a cheerful aesthetic, while also providing a connection back to the safe, familiar space of the school. Students can peek both ways through the portholes, providing a layer of protection from the unknown. 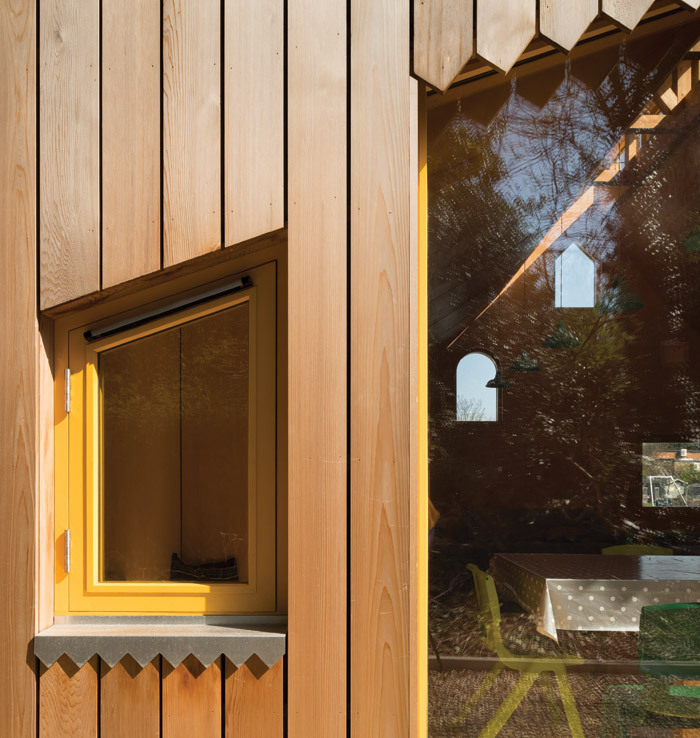 On the woodland facing side, full height windows stretch the width of each room, strengthening the connection to the woodland and ensuring that, in all weathers, the children are immersed in it. In a London state school, students rarely get a strong connection to nature, much less extra-curricular facilities that actively encourage a dialogue with it. The gateway building is just that – it transports students away from the monotony and routine of the classroom and towards a place of discovery. The architecture forms a threshold between the old and the new – but it also does much more. By inhabiting the threshold with learning spaces, it becomes more familiar and offers students a place to pause. As students explore the new world opened up to them, the gateway stands tall behind them, a sturdy anchor they can retreat back to.